Know your car's value in minutes. Trade-in at Colony Ford today and take advantage of tax savings. Colony Ford will honour your trade in offer – and might even pay more. 2017 JEEP COMPASS This 2017 JEEP COMPASS is a TRADE-IN, in great condition and comes with several great features such as: Black Exterior Paint Perforated Leather Interior Automatic Transmission Remote Start Power Seats Power Mirrors Remote Keyless Entry Power Moonroof and more! CARFAX REPORT: CLEAN NO RECORDS FOUND This vehicles Price is Advertised Sale Price plus HST and licensing. Every used vehicle coming from Colony comes safety certified with emissions testing and a professional detail clean. Colony offers a variety of financing options for most of the vehicles on our lot, through most major banks or our in-house leasing company. We explore all possible avenues to provide you with the right financing solution to fit your needs. Colony uses market leading third party software that measures your vehicle against every other similar vehicle on the market. That means we can determine the right value for your trade and ensure that we always price the vehicles we have on the lot for sale according to current trends and values in our competitive market. Shop with confidence knowing that the price we are offering you on your trade or to purchase one of our vehicles is the right value; we have already done the shopping for you! Come and see what Colonys Used Department has to offer! We are a Family Owned and Operated business that has been serving our community for 50 years. Over those 50 years we have built a strong reputation for putting customer experiences first. Our founder has instilled the values of treating everyone fairly and like family. Thats why Colony Ford Lincoln goes the extra mile in inspection, reconditioning and service to make sure that your pre-owned vehicle feels perfectly new to you! We are located at 300 Queen Street East in Brampton right near Highway 410. We do everything we can to ensure you have an incredible experience here at Colony. Call us today, we look forward to earning your business. 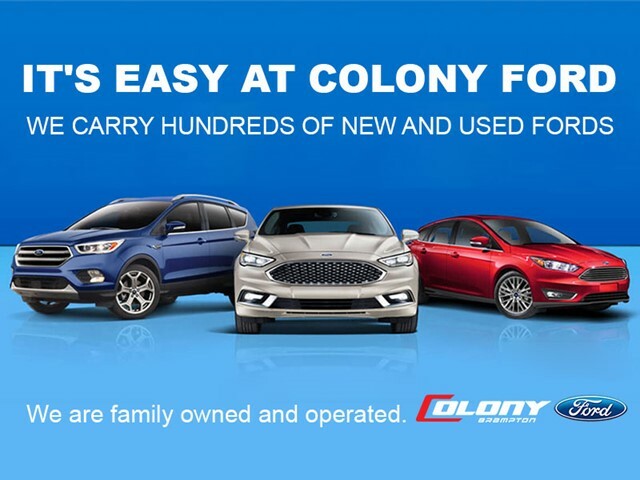 Get a trade-in offer from Colony Ford without setting foot on the lot.